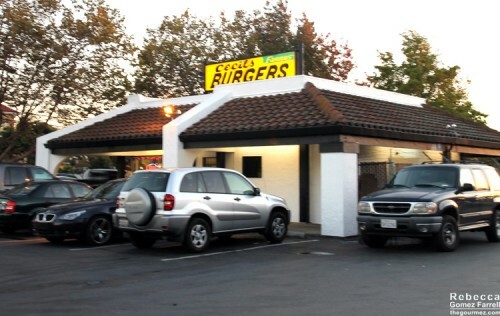 The next stop on my Burger Joints of Hayward tour is Cecil’s Famous Burgers, found due to its Yelp rivalry with Val’s Burgers, the most iconic Hayward burger joint I can think of. Being as I’m not that enthused with Val’s (still planning a return visit for a review), I was rather intrigued by this supposed challenger. Its nondescript exterior with only a window to order from and a few outdoor tables to use struck me as just right for a potential dark horse in this race. Would the burger also hit the mark? 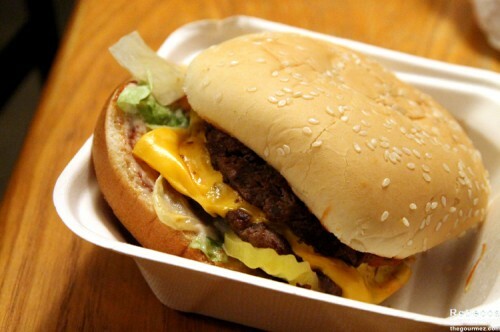 You can order Cecil’s burgers in sizes ranging up to the 1/2 lb. Biggie. I opted for the 1/3 lb. Super. Patty: Two thin patties that tasted adequate but would have benefitted from more char from the griddle. The novelty of serving cheese between them may be inspired. Or maybe I just don’t eat enough doubles. Cheese: American slice added on for 35 cents. The melt was nicely done, on the verge of drippy. Is that why y’all order doubles all the time? For cheese between the patties? Bun: Giant-sized sesame bun that was needed to contain all that delicious sloppiness and held up through the whole sandwich. Toppings: The cashier told me it comes with a mix of ketchup and mayonnaise for condiments, but what she meant was that ketchup comes on the top bun and mayonnaise on the bottom. Also included is pickles, a thin slice of hothouse tomato, shredded iceberg lettuce, and thickly chopped onion sliced in wedges rather than rings or diced. Fresher produce would have been nice, especially to replace the limp lettuce. 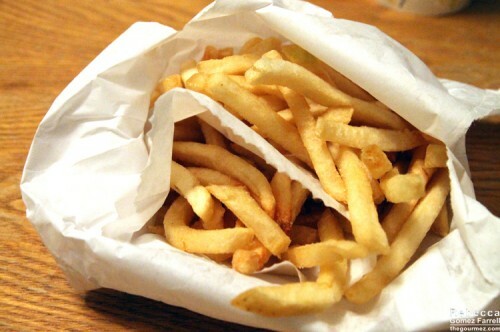 Fries: I was ordering for myself and my husband this time, so I got us one each of the fries and onion rings. Both were moderately portioned and moderately priced at $2. 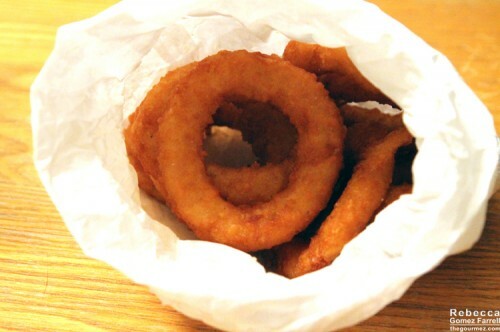 The onion rings were of uniform size, crispness, and coloring and pleasing if not memorable. The shoestring fries were classic McDonald’s style with the right amount of salt, but too many were limp and in tiny bits. Shake: Cecil’s stands out for its ice cream selection for a burger joint. They have a whole menu devoted to sundaes, scoops, and shakes. We shared a banana shake, which you can get real banana added to for an upcharge of 45 cents—Cecil’s is fond of all those upcharges. The banana flavor was present in both the ice cream itself and in the small chunks of banana, which impressed me—I hate when a flavored shake tastes mostly of vanilla. I could drink it through the straw without too much sucking power. 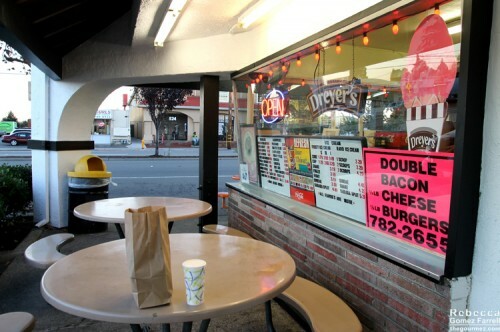 Price: Even with the cheese and fresh banana, Cecil’s comes in at only $12 for a burger, fries, and a shake. That’s right in line with the other burger joints I’ve tried. Good to know! Am NOT a fan of Val’s myself… the cash only thing is one thing, then the price in which does not match the quantity nor the taste in which is very bland, nothing special or unique in any way. Even had a steak there once n had zero flavor-ugh. 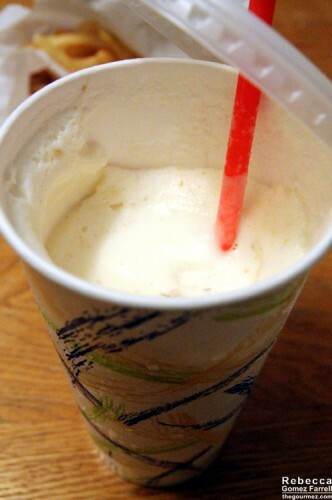 I’m convinced people only like Val’s because the shakes are good…and I haven’t tried those yet. The warm toppings on their tables gross me out. I’m w/ u! Nothing special about the burgers w/ bland meat in a little bun?